In general a sample can merely be dated with a sufficient degree of statistical coverage, if it has a quantity of at least 60-70 annual rings. Only in exceptional cases a sample with less annual rings might be dated. Referring to statistical data the average age of trees used for constructional purposes is about 60 to 120 years. The suitability of a timber for sampling, therefore, has to be subjected to this impotant quality criterion first. This implies that building researchers and archaeologists have to pay plenty of attention to the choice of the appropriate timbers for sampling. However, even if a sample contains a sufficient amount of annual rings, there is no guarantee that the sample can be dated. A possible reason for this can be the more or less distinctive, individual growth-conditions of a tree. Samples of oak wood showing different qualities. Top of the image: slow and steady growth; In the middle of the picture: wildly fluctuating annual ring widths usually indicate predominance of individual influences on growth; At the bottom of the picture: large ring wigths – hardly suitable for dendrochronological dating. 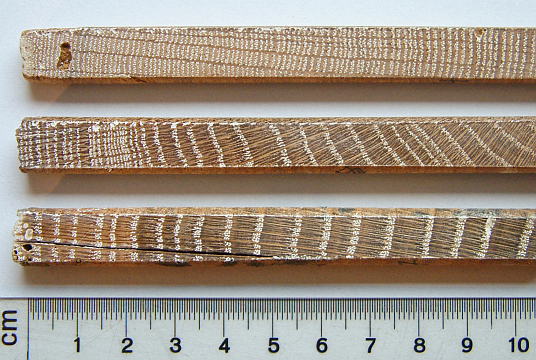 The average rate of datable timbers for northern Germany is about 60 to 70% (please see Eckstein, Busse, Lobbedey: Dendrochronologische Datierung in Kirchendachwerken der Hellwegzone. In: Westf. Zeitschrift, Band 141/91). Especially buildings, erected in regions where no significant forest stands with suitable timbers for construction were available -and are available up to the present-, are extremely difficult to date. 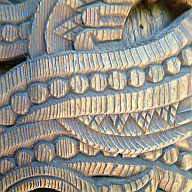 Although records often tell us about timber trade (staple, customs-/sound- register) and may point to possible locations of origin, trade connections often changed. Nevertheless, a successful attempt to date can only be carried out, if the origin of the sample material is known. From the dendrochronological point of view the coastal regions of northern Germany and the Netherlands belong to those quite problematic regions mentioned above. It is known that the city of Bremen, as well as the city of Groningen for instance, has been supplied with timber from the upper Weser area. For rivers were the main transport routes for such material, the origin of timber may be tracked without historical records as well. But a reliable indication of origin can solely be the written historical source, which directly testifies the purchase of timber for the construction. The so called “Klosterhof” in Nordleda (in the vicinity of Cuxhaven) for instance, gives us an idea about timber trade, as the surviving written sources tell us that beams of coniferous wood were purchased in the Baltic area. When the Netherlands started to import timbers from southern Scandinavia at the beginning of the 17th century, they still could draw on very old trees from the vast forest stands. Those trees grew very slowly and, therefore, had a very dense sequence of annual rings. Identifying such timbers is rather easy as well as dating them. Because of the high amount of annual rings, the datings of these timbers may be regarded as mathematically very well backed.